Former first lady Laura Bush has criticized the Trump administration's "zero tolerance" policy that has seen nearly 2,000 children separated from their parents in two months. Bush, who rarely speaks out on politics, wrote an op-ed in The Washington Post on Sunday. The wife of former president George W. Bush called the policy "cruel," "immoral," and said it "breaks my heart." Bush said the policy is reminiscent of the internment of Japanese Americans during World War II which is now considered "one of the most shameful episodes in US history." 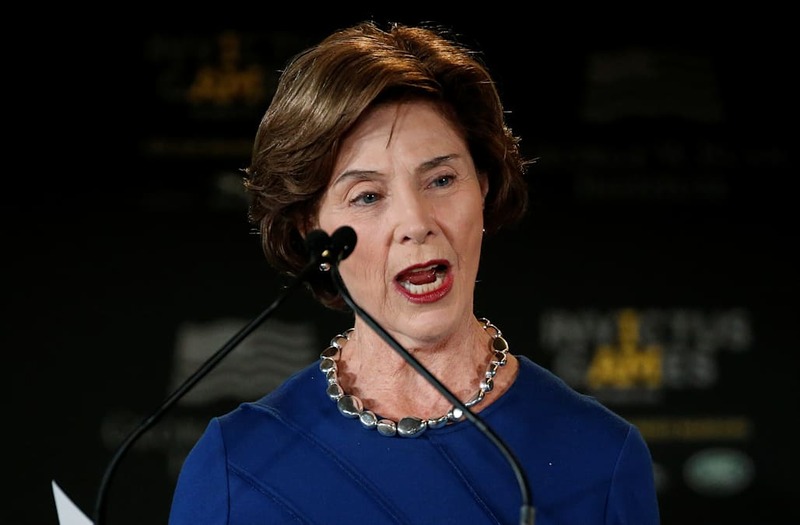 Former US first lady Laura Bush rarely speaks out on political issues but on Sunday she openly criticized the Trump administration's separation of children from their parents along the border. In April, Attorney General Jeff Sessions announced a "zero tolerance" policy towards migrants crossing the US border illegally, which leads to adults being tried as criminals and thus losing custody of their children. In that time, nearly 2,000 children have been separated from their parents leading to crowded facilities and devastating scenes. In an op-ed published Sunday in The Washington Post, Laura Bush said the policy "breaks my heart." "The reason for these separations is a zero-tolerance policy for their parents, who are accused of illegally crossing our borders. I live in a border state. I appreciate the need to enforce and protect our international boundaries, but this zero-tolerance policy is cruel. It is immoral. And it breaks my heart," Bush wrote. Bush then said the detention facilities being used to house thousands of children are "eerily reminiscent" of the internment camps that held 120,000 Japanese Americans during World War II, and are "now considered to have been one of the most shameful episodes in U.S. history." Bush highlighted how this internment affects individuals mentally and physically. Japanese Americans who were interned, half of whom were children, are now more than twice as likely to suffer cardiovascular disease and even die prematurely. Separating children from caregivers can also cause irreversible harm that affects a child's ability to cope and self-soothe, which can lead to depression and post-traumatic stress disorder (PTSD). "Americans pride ourselves on being a moral nation, on being the nation that sends humanitarian relief to places devastated by natural disasters or famine or war. We pride ourselves on believing that people should be seen for the content of their character, not the color of their skin. We pride ourselves on acceptance. If we are truly that country, then it is our obligation to reunite these detained children with their parents — and to stop separating parents and children in the first place," Bush wrote. After describing how some staff at detention centers have reportedly been ordered to not touch or comfort children, the former first lady also recalled the time in 1989 her mother-in-law and then-first lady Barbara Bush picked up and soothed a dying baby in a home for children with HIV/AIDS. "She simply saw it as the right thing to do in a world that can be arbitrary, unkind and even cruel. She, who after the death of her 3-year-old daughter knew what it was to lose a child, believed that every child is deserving of human kindness, compassion and love," she wrote. "People on all sides agree that our immigration system isn’t working, but the injustice of zero tolerance is not the answer," she added. "In 2018, can we not as a nation find a kinder, more compassionate and more moral answer to this current crisis? I, for one, believe we can." Read Laura Bush's full op-ed in The Washington Post here.